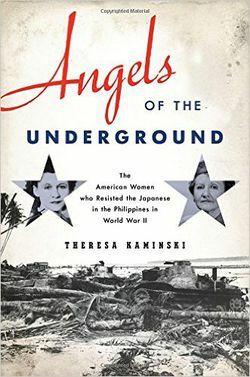 The Oxford University Press recently published Theresa Kaminski's Angels of the Underground: The American Women who Resisted the Japanese in the Philippines in World War II. Kaminski's book follows the lives of four American women who were stranded in the Philippines after Japan invaded during World War II. Publishers Weekly described her book as a "fast-paced true story" that documents how these women resisted Japanese occupation. Kaminski's other books have also examined the lives of women in the South Pacific during World War II. Her previous books include Prisoners in Paradise: American Women in the Wartime South Pacific and Citizen of Empire: Ethel Thomas Herold, an American in the Philippines. She also edited Dorothy Dore Dowle's autobiography Enduring What Cannot be Endured: Memoir of a Medical Aide in the Philippines in the World War II. Kaminski is currently a Professor of American Women's History at the University of Wisconsin-Stevens Point. You can also follow her on Twitter or Facebook. 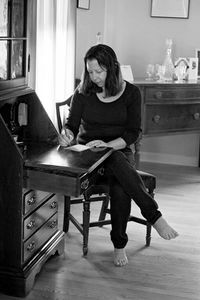 I would also recommend checking out her fantastic blog at www.theresakaminski.com. If someone asked you to quickly summarize your book, what would be your 2 minute elevator version? Angels is about the incredible risks American women took and the impossible choices they made to not only survive a wartime enemy occupation, but to undermine the Japanese occupation and help others survive it as well. It’s a World War II story few people know. Your previous historical works have also focused on the Philippines and the South Pacific. How did you become interested in the Philippines? From the academic side of my life, I have been fascinated with imperialism and colonialism, the kinds of hierarchies they establish and reinforce, and what that all means to the people who experience them. As an American historian, this interest directed me to the Philippines. I was especially intrigued by the women who decided to move so far away from the States to be a part of this imperialist enterprise. From the personal side of my life, my father, who enlisted in the U.S. Army when he turned 18, always spoke fondly of the Philippines. He was stationed there for a time after World War II, so his experiences were with postwar rebuilding. I was glad he had positive memories, but when I became a historian, I wanted to know more about what contributed to the creation of those experiences and memories. So those two sides of my life converged, and I started designing research projects to help me explore these issues. Also, because I live in Wisconsin, I like writing about warm places. When did you first learn about the exploits of the four women who became the focus of Angles of the Underground? Did you learn about them as part of your other research projects? My first book, Prisoners in Paradise, focuses mostly on civilian women who were interned by the Japanese for the duration of the war. As I researched that book, I kept finding women, including those who went on to be featured in Angels, who managed to evade internment. I ended up incorporating their stories into a couple of chapters in Prisoners in Paradise. But the stories of Claire, Peggy, Gladys, and Yay--especially because they evaded internment for a larger purpose beyond personal safety--were so big and complex that they also needed a separate book. When did you realize that you had enough material for more than just an article? What convinced you that this project merited a book? From the beginning, this project was conceived as a book. I’m too long-winded to write articles. The story of Angels always struck me as being too sprawling to be contained in an article. I didn’t realize how lengthy the book would be, though, until I was well into the first draft. To make sense of what these women did during the war, I had to provide contextual information about the Philippines and about the war itself. Your book uses archival research, FBI documents, and memoirs. What surprised you the most in your research? I was stunned by the size of Claire Phillips’s FBI file. I obtained it through a Freedom of Information Act request and didn’t know quite what to expect. The FBI kept tabs on her after the war and interviewed a lot of people about her. I don’t want to give away too much about Claire’s story because that’s all in the book, but it’s fascinating. In terms of unexpected sources, I found a collection of letters written by Lorenza Amusategui O’Malley that I hadn’t realized existed. Lorenza knew both Claire Phillips and Peggy Utinsky in Manila during the war, when she and her husband were involved in underground work. Lorenza’s perspective of what Claire and Peggy accomplished and how really gave me a lot to think about. We really are heroes of our own lives. Aside from discussions about the Bataan Death March, I have always thought that the occupation of Philippines has been typically treated in a far too perfunctory manner. How does you book add to the understanding of this extraordinary and truly tragic event? I hope it helps to fill in that very gap you mentioned. The standard military narrative uses General Douglas MacArthur as the bookends for the war in the Philippines. When the collapse of the U.S. and Filipino forces was inevitable, MacArthur was evacuated from Corregidor to Australia in March 1942. Most histories cover this, the Death March, then resume with MacArthur’s return to the Philippines in late 1944. By broadening the story beyond these military events, we can see more of what happened to the people and even to the city of Manila. What happened between the time when the Japanese occupied Manila in January 1942 and when they were finally driven out after the Battle of Manila in early 1945? For three long years, people in the Philippines endured an occupation. What was that like? What did it take to survive? That’s what I wanted to know. What core messages do you hope your readers will take away from your book? There are two main messages. First, women have always been integral to war efforts. Their contributions have often been minimized with qualifiers: they “only” did this, they “only” did that. But everything they did mattered. Second, we have to stop looking for perfection in our heroes. Courage comes in many different forms and degrees. Sometimes it’s temporary--specific to a time and place. The women in Angels were anything but. They were courageous and even heroic at times, but that didn’t make them perfect people. How could your best use Angels of the Underground in a history class? What type of classes do you think it would work best? It could be used in a women’s history class, a women/gender and war class, or even a course that teaches methods of historical writing. The book was written to attract a general readership, so while it’s based on all of the appropriate primary and secondary sources, the story is very front and center. This page was last edited on 5 December 2016, at 15:02.